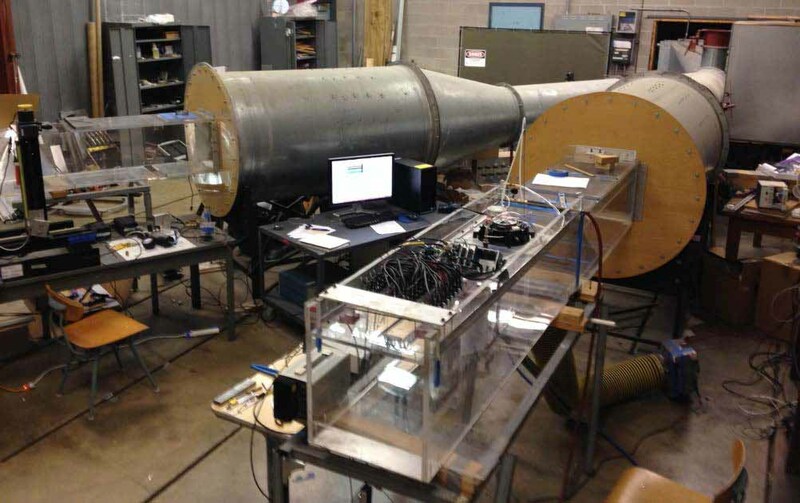 The low-speed wind tunnel is a blower type tunnel which features two test sections (each 0.38m x 0.38m). Included is the capability of increasing free-stream turbulence levels as high as 12% and a built in heater to be used for heat transfer applications. A variety of experimental studies have been performed on this facility covering the topics of boundary-layer interactions with free-stream turbulence and surface roughness, film-cooling effectiveness, and applications of active flow control to boundary layer separation and secondary flows. The tunnel is capable of velocities up to 30 m/s with free-stream turbulence levels less than 0.4% in a clean configuration. Flow diagnostic capabilities include two- and three-component particle image velocimetry, infrared thermography, single- and double-element hot-film anemometry, and a variety of pressure transducers and probes including a bank of 32 pressure transducers that can be used to obtain rapid measurements of airfoil pressure distributions. Flow visualization using smoke wires, tufts, and oil have been used in the past.